How to Grow Hops | Grow This! Microbreweries and home brewing is growing at exponential rates. This has lead to occasional hop shortages. Many of the largest breweries now grow their own hops. If you brew your own beer, growing your own hops as well can be an extremely rewarding venture. What’s more, it’s fairly easy and a lot of fun. Here are some simple instructions on how to grow hops at home. Hops grow along vines (aka bines), which spring from a root cutting of the mature hop plant called a rhizome. Rhizomes can be difficult to come by. They are usually available in March and April and some retailers may have pre-sales in February. Consult local home brew stores or check online for availability. Rhizomes should be kept in the refrigerator (not the freezer) until planting. Rhizomes are planted in the early spring, begin to flower toward the end of June, and are ready for harvest in late August or September for most areas. Plant just after the danger of frost has passed. They’ll need 120 frost-free days. The first year will not produce a large yield. Hops really begin to produce in their second year. Hops can be grown in any moderate climate. Each hop plant needs 3-5 feet of space around it and a support structure, such as a line, pole or trellis, along which to grow. A wall or fence can work well – they’ll need up to 25 feet or more of vertical space to grow. Hops should be grown with full exposure to the sun (6-8 hours direct sunlight per day). If you grow them in partial shade, the cones will be smaller, meaning less yield. Hops need fertile soil that drains easily. Loose, aerated soil is best. The soil pH should be 6.0-6.8. Sow hop rhizomes under about 4 inches of soil. If already flowering, plant them with the budding end up. Otherwise place them horizontally in the ground. Space mixed varieties 5 feet apart and like varieties 3 feet apart. For better drainage, build and plant in a small mound. Mix in lots of mature compost and organic fertilizer or aged manure before planting. The best method for watering hops is to give them a good soak, let the soil dry out and then water again immediately. They can handle consistently moist soil but it can cause root rot. Do not leave the soil dry for very long between watering. Hops like consistent watering, so a timer can be very useful. Use organic mulch to maintain soil temperature, moisture, and to fight weeds. Hops will benefit greatly from an occasional feeding of organic fertilizer or compost tea. Avoid fertilizers that contain too much nitrogen, which can result in a leafy plant but poor hop cones. Plan to grow hops next to a fence, wall, trellis, strong lines or tall poles. Try stringing a line (use sturdy, soft twine) from each mount to the roof of your garage or house. They’ll need 25 feet of length or more that can hold up to 20lbs of weight. Once the vines reach about 1 foot long, you can begin to wrap them carefully, clockwise along the rope. Very quickly they will continue to grow along the rope without assistance. Keep in mind that hop vines can grow 1 foot per week. Do not leave the vines on the ground for long or they will develop disease and attract pests. You will not get much yield the first year. Hops begin to flourish in their second year. Hop cones will begin to form shortly after flowering begins but need a couple more months to fully mature. To check for ripeness, squeeze the cones gently. A damp, fully green cone that stays compressed after you let go is not ripe. As they mature, they will dry out, become very aromatic and will expand back to their original size after a soft squeeze. They also begin to develop a sticky, yellow powder on each of the cones. When ready for harvest, cut down the vine and allow it to dry on the ground. 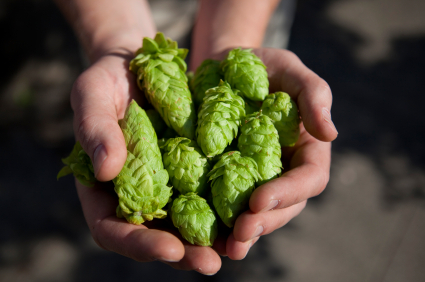 Carefully cut off your hop cones and prepare to dry them out. A food dehydrator works well to dry hops. They’ll need a few hours to dry thoroughly. When they are ready, the cone will be completely dry inside and the petals will break off easily at the stem. You can also dry them in the oven at the lowest temperature or in direct sunlight. Do not over dry to the point where the hops crumble in your hand or become brown. Store hops in an airtight container in the refrigerator or freezer. First year crops tend to prefer short, frequent waterings. In subsequent years, switch to longer soaks or a drip system. Hop vines (also called bines) grow vigorously and can become unruly and take over a garden. Give them ample space, prune back as needed. Prune off the first shoots that appear in year two of growth. Choose 3-4 main vines for growth from each plant and prune off the rest to allow maximum energy and production for the main vines. Prune off the bottom 4 feet of leaves to help prevent plant disease. In each subsequent year, dig up the rhizomes and trim the roots back to about 1 foot in the spring. Otherwise, they may grow too unruly to manage. After harvest, cut back your bines to 3 feet. Frost will kill the rest when winter comes. Hop cones do not ripen all at once. Be prepared to harvest and dry them out regularly as each becomes ready.